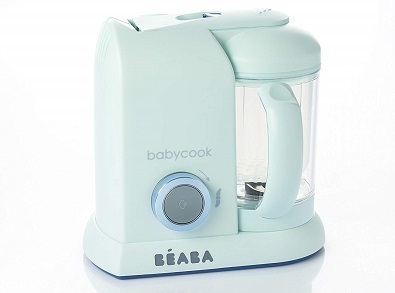 Looking for the best baby food maker? With working moms being the norm, and all young moms learning to cope with baby’s demands for healthy, nutritious food, this is an absolute necessity. You can now steam cook, blend, puree, warm, defrost, sterilize and do much more with multifunctional food-stations. 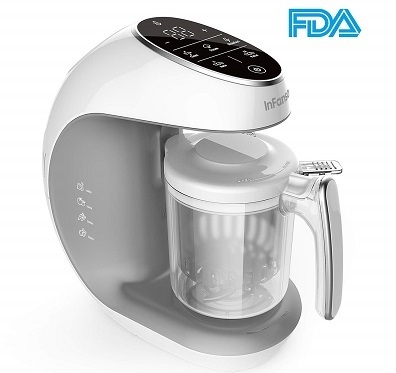 This baby food processor is a great buy when you need to prep for meals and prefer to refrigerate and use in small pouches and quantities by defrosting, warming and blending to feed the baby. Make your baby’s food at home with the two baskets for steaming and a tri-speed programmable blender allowing you to vary time to keep all vitamins, nutrients, and flavors locked in. The best part the baby gets food that you eat and not expensive shop food. Simultaneous use of blender and steamer with 11-cup capacity means you could make a week’s food and store it for use. Multi-functionality translates into large time-saving! Detachable components that can be cleaned in the dishwasher. Programmable with alerts and LCD-display. BPA, Phthalate and lead-free meaning baby get food free from poisonous chemicals, additives, and unnecessary sugars. The countertop is friendly with space saving design. There are limits to its tri-speed blender blade. Suggested smaller batch sizes to overcome the issue. Steamed food needs to be scooped out into the blender. Multi-functionality, time and space-saving count hugely in its favor. The device can be used as sterilizer and for warming bottles as well. Versatility, great prices, and the extremely helpful list of cook-time for many popular ingredients make it user-friendly. It is safe, comes in two sizes and has a life-long warranty. All moms rate the time saved and easy multi-programmable panels with alerts as a great feature. This baby food blender of 4.5 cup capacity helps you cook, steam, blend, defrost and warm in minutes. Besides being a great-looker available in 8 colors, it is now easy to have baby fed on chicken broth, mashed rice, sweet potato, fruits, and vegetables of your choice, within 15 to 20 minutes! Suitable for any stage in baby’s growth it can cook from raw to ready-to-serve very quickly. Blend your foods with ease for the whole family with 4 functions built-in for easy functioning. Large 4.7 cups capacity with markings makes up to 18 servings in one go. Easily programmed with auto beeping when done. One- handed use with single touch easy opening and closing. Steam basket collects food and broth separately. No more dumping water and build-up of deposits in water-tank as it uses all the water provided. Larger capacity and more functions are being added to the rather basic model of baby food makers. Depends on water levels you add and not on the timer settings. Patented steamer with all-in-one built-in functionality grows with the baby. Excellent capacity to grow from sterilizing and defrosting to blending, puree making, steaming, broth collection means it grows from baby’s needs to family needs. A narrow-space print makes great use of French technology and innovation providing ease of operation and ideal for cooking not-to-large portions of baby food. Lead, Phthalate and BPA free products mean being health conscious. The easy single-handed operation, multi-blade blender, clear instructions and recipe manuals added to easy cleaning makes this reputable quality product a must-buy. This mini baby puree maker is a winner with a not-so-small ability to operate on all tasks of getting hygienically prepared, home food rich in nutrients for baby and family. Small footprint with four functions to be able to multitask between reheating, steaming, puree-making, blending and defrosting prepared refrigerated homemade quickly. Silent motor and single-hand controls mean you can allow baby to watch as you cook. 5-second surges with precision blades make puree making a breeze! BPA free, dishwasher safe with detachable components supports ease of operation. Pureed food is slidable easily. 120V only power restriction is a constraint. Compact, reasonably priced and easy-to-tuck away features are sure pluses with this device. Its multi-functionality means the use of a single device to complete food preparation. The single-handed operation is a huge plus with a baby in the arm. Save some money and time while feeding your baby with a great choice of healthy foods instead. It has a great mini price too! 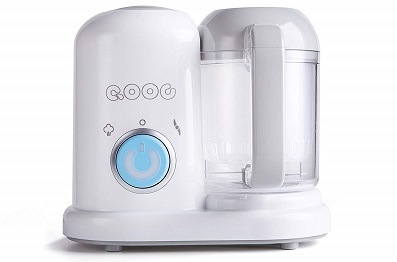 This baby food cooker for toddlers and infants is especially friendly when you look for great prices and functionality in making your baby food at home. Chunky or pureed it can easily deliver great and safe quality food for babies. Can chop into chunks and grows beyond the pureed food stage with the baby. Single-touch self-cleaning is also dishwasher safe. 20 Oz single cup for three meals capacity. Safe operation with anti-dry-run and overheating protection. The self-cleaning option is not so popular. Requires descaling and airing out after cleaning. Its great price and absolutely workable features are a great boon. Additional discounts add to its graces. The all-in-one cup is great for preparing three nutritious meals at a time. The price, quality, functionality, and design are also right. Suitable for all ages of kids and later for family-use means value-for-money. Why We Recommend These Products. There are no compromises to feeding your baby right. 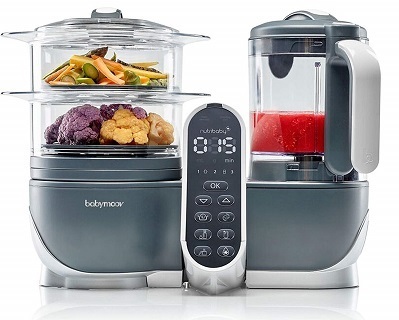 Switch to the best food processor for baby food to liberate, save time and money when providing baby the best-quality nutritious home foods. Safe devices that are easy to clean and rightly-priced mean a great package is always available to you with ample choices of quality hard-to-beat products.